I’ve spent the past few weeks considering young, up-and-coming players as part of my ongoing offseason profile series. Last time, I looked at Max Kepler, who might be on the verge of a breakout based on his plate discipline and batted ball metrics. I’ll stick in the AL Central this week, but I’m going in a completely different direction. This will serve as a quick reminder that Miguel Cabrera still rakes. Everyone knows what Miguel Cabrera’s achieved in the past. It’s not necessary to run down his career in-depth. He’s a future Hall of Famer, one of the greatest hitters of his generation. What is worth remembering is that, before going down with injury last year, Cabrera was en route to a strong season. Of course, any discussion of Cabrera must begin with his injury. He suffered a rather gruesome biceps strain on a swing last June, necessitating season-ending surgery. Yet that will be 10 months removed by Opening Day. Cabrera’s healthy again. Jason Beck at MLB.com reported last week that Cabrera’s on track to report to spring training without restrictions. What’s more, he sounds anxious to go. No one would expect Cabrera to say anything different, of course, but it’s encouraging to hear that he’s entering 2019 with no reservations. 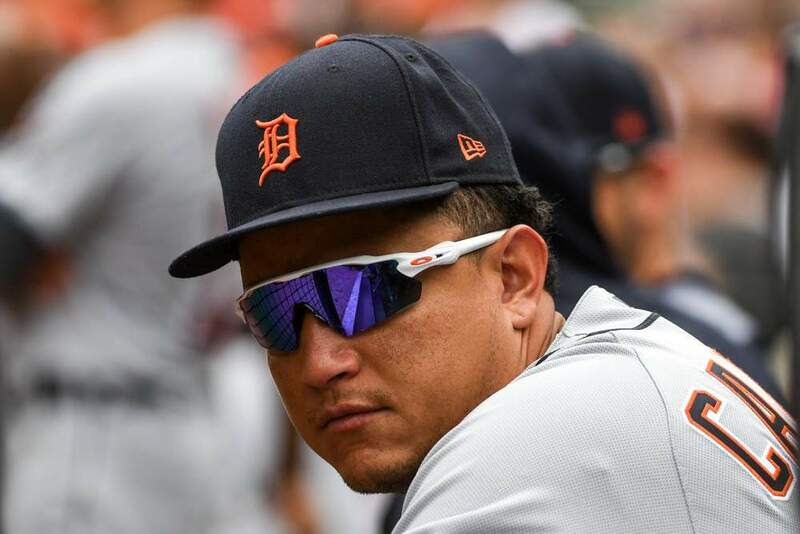 It would be easy to have the thought of blowing out the tendon again in the back of his mind, but, at least publicly, Cabrera seems to have no such reservations. More to the point, though, is that owners seem to have forgotten what Miguel Cabrera was capable of. Even entering his age-36 season, Cabrera remains a great hitter. Before the injury, he was well on his way to reaffirming that. In 2017, Cabrera’s numbers went backward. Some of it was bad ball-in-play luck, but he also struck out at a career-high clip and lost nearly three miles per hour of average exit velocity from the year prior. He looked to be nearing the end of his rope. That changed in 2018. Never a paragon of plate discipline, Cabrera began to adjust his profile last season. He was more patient in the early going, on pace to run the lowest swing rate of his career. At the same time, his bat speed remained very much intact. His 94.4 MPH average exit velocity in 2018 was a return to its previous levels, and Cabrera got back to pulling the baseball. As players age, their athleticism and bat control wane. Those who age well tend to do so by becoming more selective; no longer can they get away with golfing pitches out of the dirt, so they focus on only swinging at pitches on which they can do damage. Early last season, Cabrera was making that transition. This isn’t to say that the Cabrera of old is returning. His days of being baseball’s best hitter are in the rearview mirror. He doesn’t make as much contact as he used to, and his emphasis on pulling the ball last season resulted in an alarming spike in grounders. Cabrera isn’t going to hit .350 with 40 homers again. At the same time, he certainly looks productive. He makes contact at an above-average rate, and there’s no questioning his raw power. Per Statcast, Cabrera twice exceeded 114 MPH on batted balls last year, a feat which only 52 of 390 hitters with at least 100 plate appearances managed. Cabrera’s been treated as an afterthought by fantasy owners, though. Luke Voit, whom Steamer projects to hit .262 with 18 home runs, is being drafted before Cabrera on average. Joey Votto’s coming off the board 120 picks before Cabrera. Votto should get drafted before Cabrera because he doesn’t come with the same durability concerns, but their projected outputs are not all that dissimilar. Steamer forecasts Votto to hit .278/.409/.464 with 22 homers; Cabrera’s projected at .283/.368/.480 with 21 bombs. In on-base leagues, it’s advantage Votto; in standard formats, though, it’s awfully close. It’s certainly not a 120-pick gap. Fantasy owners have given up on Miguel Cabrera. He ended last season with a serious arm injury, so it’s fair to fade him a bit; there’s no guarantee all his power comes back, especially at his age. But the risk-aversion here has gone too far. First base is particularly top-heavy anyhow; outside of the top three or four, the players involved are somewhat fungible. If Cabrera doesn’t show well early, it wouldn’t be difficult to pivot to someone in the Tyler White mold to step in. Currently, owners are getting a top-50 ceiling in the 18th round. Why aren’t others taking a shot in the tenth? Enjoying Anthony’s Miguel Cabrera profile? For more great rankings, strategy, and analysis check out the 2019 FantraxHQ Fantasy Baseball Draft Kit. We’ll be adding more content from now right up until Opening Day!